On January 27, LDH announced that E-girls will be reduced to 20 members from the current 26 under a new system for the members line-up, called E-girls Pyramid. Under this organizational structure, the E-girls members are reevaluated every year. After the reevaluation, members who are deemed to be in need of more training have to exercise themselves in Rabbits (senior high students and above) or Bunnies (junior high students and below). With that, members Takebe Yuzuna, Hagio Misato, Inagaki Rio, Ikuta Risa, Nakajima Momoka and Watanabe Marina returned to the training period at EXILE PROFESSIONAL GYM, reducing E-girls to 20 . We sincerely thank you for your continuing support to the E-girls. 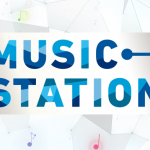 This time, we have an announcement to make here about E-girls’ future development. E-girls, as a girl’s entertainment project, inheriting EXILE’s DNA and centering on the concept of “shining like a diamond”, keeps honing and showing the girls’ unique “charm” to challenge new possibilities of girl’s entertainment. 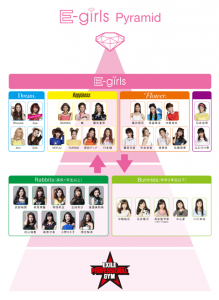 The group of E-girls was established on the system of E-girls Pyramid with E-girls at its summit. E-girls includes many other groups like Dream, Happiness and Flower, and also other subsidiary teams like Rabbits (senior high students and above) and Bunnies (junior high students and below) which dedicate to training members, also in cooperation with the EXILE PROFESSIONAL GYM. Under this organizational structure, the E-girls members are reevaluated every year. After the reevaluation, members who are deemed to be in need of more training have to exercise themselves in Rabbits or Bunnies, while members who gain recognition in Rabbits and Bunnies will get the chance to be promoted to E-girls. This is how the system works. In 2014, E-girls held their first arena tour from which they’ve gained precious experience and learned a lot of things. No matter as a group or a member, everyone in E-girls has made progress more or less. To make a bigger leap in 2015, E-girls released their 3rd album “E.G. TIME” on January 1, and will hold their second arena tour from February 14. To shine more brightly and achieve higher goals, every member has to show their unique charms respectively and try harder to make progress. Thus, after our discussion on the current situation and future developments of the present 26 members, we think that all the members shall try their best to exercise themselves in a proper environment respectively. Therefore, Rabbits and Bunnies can surpass the past and expand the scope of activities as teams. Through all this, the efforts made by all the members will definitely lead to a wonderful future. Based on this idea, E-girls will change to a 20-member group in 2015 to fit into different works and media better, thus carry out activities in the best lineup. And as for the teams under E-girls, the activities carried out seperately by each of these groups will also be highlighted in an attempt to showcase the unique styles of these groups. Meantime, every member will keep on training themselves and take their own challenges for higher goals. In addition, the members who are reassigned to Rabbits and Bunnies will train themselves through Musha Shugyou to become even better girl performers with shining charms. To bring whole neew side to the future E-girls, they will carry out activities as Rabbits and Bunnies. Everyone is making progress in a proper environment respectively now. If they shine with distinct personalities and originalities, they will make progress and have the overall level of E-girls and the group of E-girls improved. Through this, we believe we can create the girl’s entertainment which we have been pursuing from the beginning. 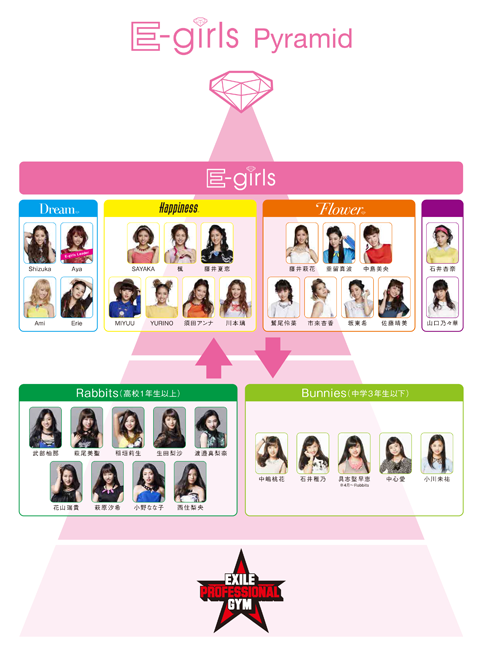 E-girls and members of E-girls Pyramid will train themselves and truly become a ray of light in 2015. All of them will improve themselves and progress towards the future to keep challenging the possibilities of the girl’s entertainment. We hope we can deliver the message of “Love, Dream, Happiness” to everybody by letting more people enjoy E-girls’ entertainment. To live up to your expectations on E-girls, all the members will work harder. So, please keep on supporting us in the future.